The Innovator’s Mindset: Empower Learning, Unleash Talent, and Lead a Culture of Creativity by George Couros gives great encouragement and advice to teachers seeking to improve continuously in the face of budget restrictions, policies that don’t make sense, and curricula that are way too static for a constantly changing world. 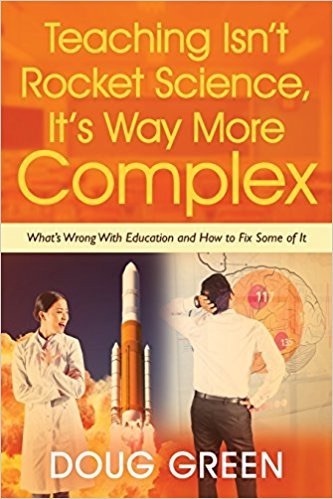 This would be a great book to give to every teacher in your school. George begins with praise for his father who was always learning and exposing his children to the latest technology from the VCR to Facebook. As an illiterate Greek immigrant, he started as a dish washer and ended up as a restaurant owner. While his father had to embrace countless changes, George regrets that many educators are more likely to resist change rather than embrace it. As a result, we have 21st-century schools with 20th-century learning. If teachers don’t understand that the world is changing and that they need to change with it, the world may decide that it doesn’t need them anymore. If it’s just about knowledge, students can find and digest that themselves. There is a need for innovation in education. Inspiration is also needed and it is one of today’s students’ chief needs. It can spark curiosity that will prompt students to learn on their own. Unfortunately, most students leave school less curious. Successful students leave school being good at school and the world isn’t school. One day they are raising their hand to go to the restroom and the next day they are on their own in a world that requires critical thinking and collaboration. George sites the failure of Blockbuster Video Rental as an example of how an organization can fail if they don’t change fast enough. If, according to the common saying, “We need to prepare kids for jobs that don’t exist,” innovation in education is essential. George even created a job title: Division Principal of Innovative Teaching and Learning. No teacher has ever had a former student return to say a standardized test changed his of her life for the better. George defines innovation as a way of thinking that creates something new and better. It can be something totally new (invention), or a change to something that already exists (iteration). It’s important to avoid thinking that any use of technology is innovative. Student essays done on a computer are probably not innovative, while a student blog may well be. Technology is a tool, not a learning outcome or a leadership outcome. As John Maxwell once said, “Change is inevitable, growth is optional.” It’s vital that education not become the new Blockbuster. We start with an inspiring story of how a student overcame a stutter by adopting the innovator’s mindset. He goes on to discuss the highlights of Carol Dewck’s book Mindset: The New Psychology of Success. See my summary here. George points out that the world only cares about and pays for what you can do with what you know, and it doesn’t care how you learned it. Every educator, therefore, needs to have an innovator’s mindset. To promote this, George made a budget line titled ‘innovation’ and it was up to teachers to apply for the money. This is like a school setting up its own grant system. He also lets teachers know about the popular mantra that says: failure is an important part of the process. Letting teachers know they have the freedom to fail will also promote resiliency and grit. The only way to innovate is to try things and see if they work or not. This must be done as you adjust to each learner. In order to innovate, you need to focus on asking questions. This will drive the process. Teachers also need to ask would they want to be a learner in their own classrooms? Lessons need to connect to students’ lives and they need to learn from each other. You also need to collect feedback continuously. 3. 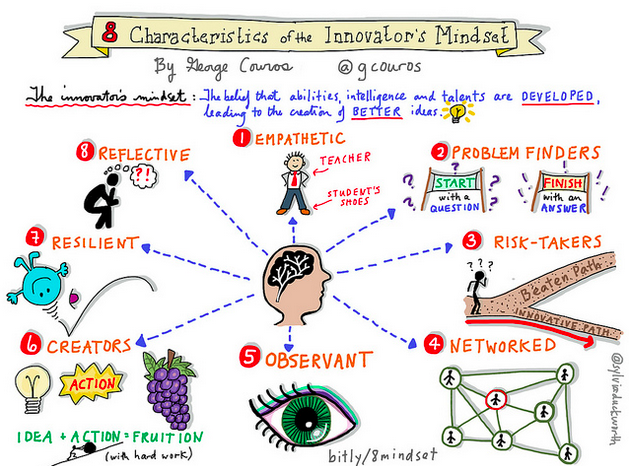 Characteristics of the Innovator’s Mindset. Silvia Duckworth’s illustration at the top lays out the eight characteristics. They are: 1) Empathetic – This is all about thinking about the classroom environment and lessons from the students’ point of view. 2) Problem Finding: This is one step beyond simply giving students problems to solve. This will help students to become self-starters. 3) Risk Takers: There needs to be a balance between drawing on one’s experience and trying something new. 4) Networked: Every idea is a network of ideas. When students come to school we continually tell them to share. Educators need to take this advice. 5) Observant: Inspiration is everywhere and often in unexpected places. You just have to keep your eyes open. Educators also need to look beyond their field for ideas and inspiration. 6) Creators: Anyone can consume information. The move from teacher-centric instruction to learner-centric creation is vital. 7) Resilient: Expect pushback from students, colleagues, and supervisors as you try new things. This is a skill that all of us need to develop. 8) Reflective: What worked? What didn’t? What would I change? What do I do next? It’s important to question your efforts, progress, and processes. This entry was posted on Tuesday, August 9th, 2016 at 8:56 am	and is filed under Book Summaries, Education Books, Leadership Books. You can follow any responses to this entry through the RSS 2.0 feed. You can leave a response, or trackback from your own site.